Lychnis chalcedonica blooms in June with large clusters of vivid, scarlet-red flowers. The flowers seem to glow in the garden like a neon restaurant sign that says, "Hummingbirds, eat here!" 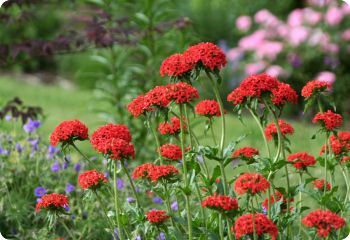 Maltese Cross is a first-year flowering perennial. This heirloom flower has been grown in American gardens since the eighteenth century. Lychnis chalcedonica can be cut back when the flowers fade to encourage repeat blooming. Deer resistant. Hardy perennial in zones 4-10. Start lychnis seeds indoors 8 weeks before the last frost date. Barely cover the seeds with soil. Full sun to part shade.